Hot Tub Time Machine 2 is a new comedy movie and sequel to the 2010 film, Hot Tub Time Machine. Steve Pink returned to direct alongside some of the stars from the original including: Rob Corddry, Craig Robinson and Clark Duke. Adam Scott (Parks and Recreation, Step Brothers) also joined the cast this time around. I really enjoyed the first Hot Tub Time Machine movie as it was very unique and hilarious. Historically speaking, comedy sequels are usually never even close to as good as the original, with the exception of 22 Jump Street and Anchorman 2: The Legend Continues. Having said that, I wasn’t really expecting Hot Tub Time Machine 2 to be that great. In the end, I can’t say it is quite as funny as the first, but it is still good for a few good laughs and a decent time at the movies. In Hot Tub Time Machine 2, we pick up right where we let off and all of our favorite characters are enjoying their rich and famous lives. 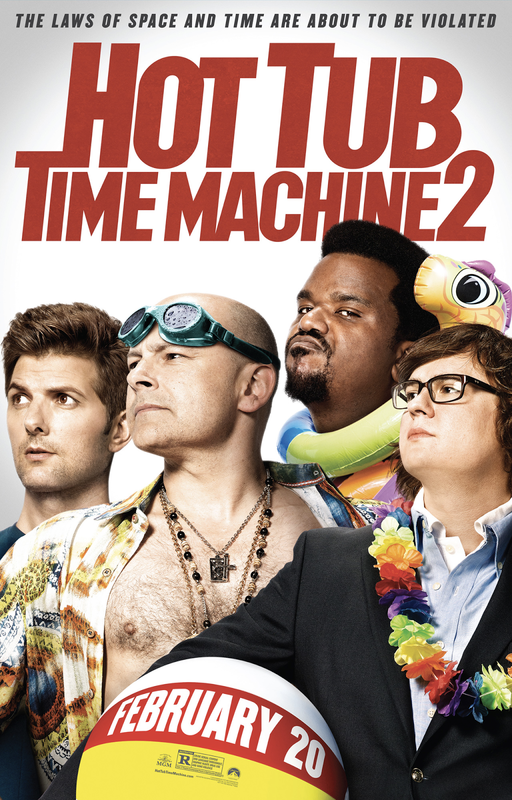 However, early in the movie, Lou (Corddry) suffers a painful accident, so Nick (Robinson) and Jacob (Duke) bring back their iconic Hot Tub Time Machine in a desperate attempt to prevent this from happening. Somehow, the machine lands the trio in the future instead, where they meet Adam Jr. (Scott), son of their good friend. They are forced to use his help and alter the future so they can save the past. As with most time travel movies, the story of this movie can be pretty hard to comprehend in parts and you could certainly pick out quite a few plot holes if you really tried to. However, I can cut the movie some slack there since this is a comedy and it even made a joke out of that confusion at times. I would also add that this movie made a lot of rather amusing references to some great time travel films such as: Back to the Future, Terminator and Looper, which I really liked. For the most part, this movie was very funny and entertaining and most of the jokes worked. However, the humor was extremely boundary pushing and even grotesque at times so I certainly wouldn't recommend this to a younger audience. Overall, Hot Tub Time Machine 2 doesn't quite live up to the original, but it is still a solid comedy movie.